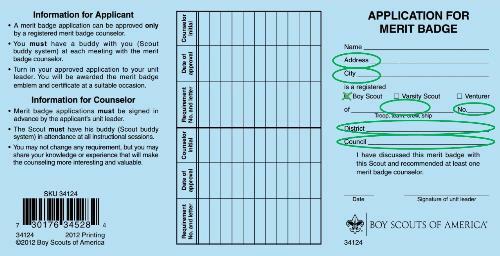 While some councils are starting to transition to electronic records, the traditional method of recording merit badge achievements is via a "Blue Card" - a 3-piece card that the Scout and Merit Badge Councilor uses to track the completion of a merit badge. One card is issued for each Merit Badge the scout is working on. They are given to the Scout by the Scoutmaster who initially signs the card and then helps the scout find the appropriate Merit Badge Councilor. There are 3 segments to the card to ensure that completion of work is properly recorded. 1 segment is retained by the Merit Badge Councilor (MBC). 1 segment is retained by the Troop's "Advancement Chairperson" who should record the advancement in the Troop/District records. 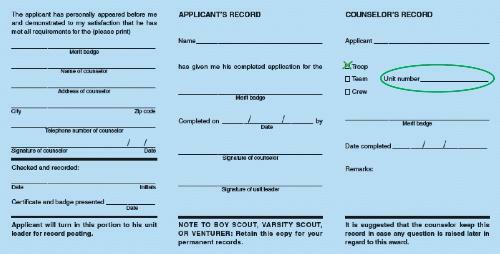 The following is a graphical overview of the merit badge blue card process. 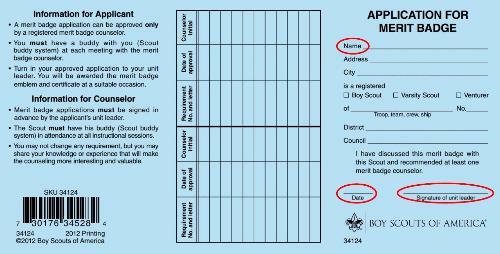 The parts to be filled out by the Scoutmaster are shown in red, the parts to be filled out by the Scout are shown in green and the parts to be filled by the counselor are shown in blue. The process is as simple as 1 - 2 - 3 . 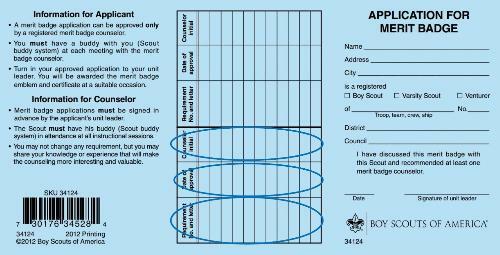 Each Scout should ask his Scoutmaster for a blue card when he is ready to be signed-off for a merit badge. The card should be filled out specifically for the Scout and the badge he is working on. 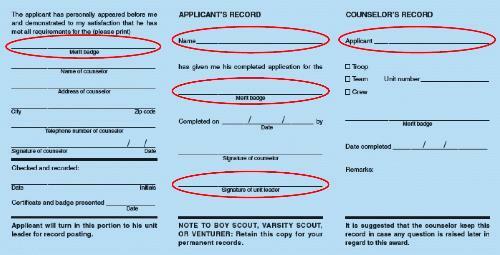 The Scout needs to fill-in some information about himself and his troop. After the Scout has completed all the merit badge requirements the counselor confirms that by completing his part of the blue card.